Postal Products Unlimited’s CBU mailbox provides a secure, free standing outdoor solution for your neighborhood centralized mail delivery needs. PLEASE NOTE: This model number does NOT include a pedestal. It is intended to be placed in an outdoor enclosure, such as a concrete pillar. Pre-configured units include built-in parcel lockers and outgoing mail collection for added convenience and can be used alone or in large groupings to accommodate every project type. Whether you plan to serve four or 2,000 residents, cluster mailboxes or cluster box units(CBU) provide a flexible solution to accommodate your building project needs.Simply select the pre-configured unit(s) that has the best options for your residents. These standard stock units can be used individually or in larger group installations- all providing a convenient, secure method of mail and package delivery to resident. CBU’s are ideal for commercial and residential developments. Postal Products Unlimited is officially licensed and Identical to Auth orized by the U.S. Postal Service to manufacture Cluster Box Units (CBU's)to U.S.P.S. "F" Specifications. USPS Approved Cluster Mailboxes are constructed of Heavy duty aluminum and stainless steel with an attractive powder coat finish. Front loading CBU mailboxes include a carrier access door prepared for a USPS arrow lock (installed by local postal officials)for delivery/service to mailbox. Tenant doors include heavy duty cam locks,each with three (3) keys. 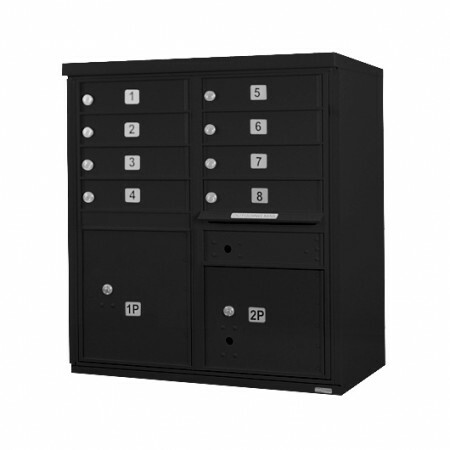 In addition, all CBUs include 1 or more Parcel locker doors - a means of USPS package delivery. Dual, captive locking system allows USPS to deliver a package to the locker leaving the key in the tenant's mailbox. Package is retrieved by the tenant and key is retained securely in the lock for the Postal Service to retrieve and reuse for the next package delivery. The Outgoing mail compartment with slot features an anti-fish comb for security, and protective hood is located above USPS access door for convenient outgoing mail collection. These units do NOT come with a pedestal,and are intended to be placed in an outdoor enclosure, such as a concrete pillar.